The best form of advertising for your business is to have your company name, phone number, web page address, email address & job description on the sides of your truck or van. These large truck decals eliminate hand lettering, are durable, and last longer than painting or “wrapping”. They are designed for use on the front and back of the truck as well as both sides. 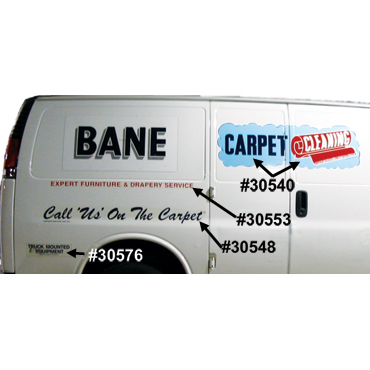 However, these carpet cleaning decals are available to Bane-Clene Carpet Cleaning systems owners exclusively. The carpet cleaning van decals make this advertising possible as you drive from one location to another. Make your van a “rolling billboard”! A clean, well-lettered carpet cleaning truck in your customer’s driveway is not only good advertising; it is a testimonial! How often have you heard of someone hiring a painter, a plumber, an electrician, a roofer because they saw the lettered van or pickup truck in the neighborhood? Happens every day! A dirty, battered, smelly, oil-leaking carpet cleaning service vehicle will lose business opportunities. If your equipment looks as though it has been through a war, you will raise doubts about your ability to provide cleaning services. 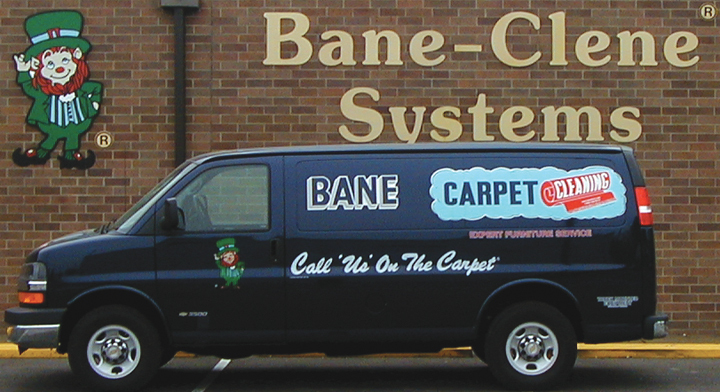 The phrases “Call ‘Us’ On The Carpet®,” “The Bane-Clene Way®” and the Jimmie Decal are all copyrighted and may only be purchased only by authorized, certified Bane-Clene equipment owners. Personal grooming, care of equipment and good manners are every bit as important as knowing how to do the job. A technician who does not use personal deodorant may never be invited back into a nice home. Image is important in business. What the prospect or customer thinks of you on first impression will affect present and future business dealings.